The Friends of the Medical School organization supports students and their parents, especially during special times like MD Convocation and the MD White Coat Ceremonies. Dr. F. Don Parsa, MD, is Immediate Past President of the Friends. help JABSOM increase opportunities for alumni to practice medicine in Hawaiʻi. Staging ʻOhana Day for the parents and families of in-coming first-year medical students. This half day event gives families an overview of the medical school experience the students are embarking on, provides an opportunity for families to meet, and welcomes them into the JABSOM ʻohana. 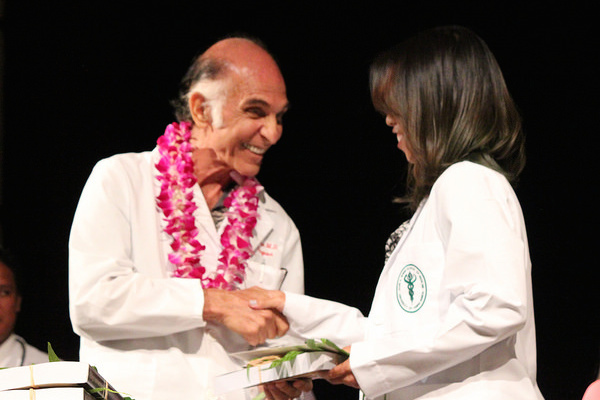 Poʻokela Noʻeau Award was established in 1997 to recognize the student selected by his or her class as having characteristics which best exemplify the quality of the ideal physician. The recipient is selected by the 4th year class. Poʻokela Noiʻi Award was established in 1997 to recognize outstanding research by a medical student selected by a faculty panel. Aequanimitas Noʻonoʻo Pono Award was established in 2013 to recognize the student who best demonstrates imperturbability in all situations and who reponds quickly, calmly and accurately in providing medical assistance. Hosting the JABSOM student Osler Society which is dedicated to perpetuating the life, teachings, and ethical example of Sir William Osler. The Friends of the Medical School welcomes everyone who wishes to support the John A. Burns School of Medicine and its students. To view the most recent Friends newsletter, click here. To donate, please click here for a printable gift form.